Maricopa Skill Center (MSC) recently received accreditation from the Joint Commission on Allied Health Personnel in Ophthalmology (JCAHPO). 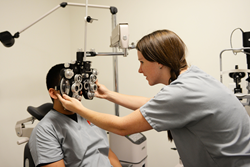 MSC is the only school in Arizona to offer an Ophthalmic Assistant program. The accreditation is valid for three years and allows MSC students and alumni of the program to sit for their Certified Ophthalmic Assistant exam after working in the industry for 500 hours. The first group of students to attend the ophthalmic program started in February 2013 under a temporary accreditation issued by JCAHPO. While enrolled in the program students learn the core level of care for an entry-level position in a clinical or office setting. The course prepares the students to assist an ophthalmologist, specialists in medical and surgical eye problems. The Ophthalmic Assistant program is 702 hours long, approximately seven months. Classes are held, 8 a.m. to 2:30 p.m., Monday-Thursday. Students participate in a 120-hour externship as part of their training. MSC’s next session of the program starts Aug. 3. Interested parties are required to attend an information session, which will provide in-depth information and enrollment guidance. Healthcare program information sessions are offered on Tuesdays from 1 to 2 p.m. No registration is required for information sessions. Maricopa Skill Center is the Valley’s leading workforce development center since 1962. Through education and training, MSC graduates possess the industry-identified skills necessary to achieve long-term economic independence. MSC offers a variety of certificate programs for careers in business, technology, health care, and trades, most of which can be completed in less than a year. Small class sizes, self-paced learning, and hands-on classrooms are just a few of the benefits of training at MSC. Visit us or call (602) 238-4301 to learn more. MSC is a division of GateWay Community College, one of the Maricopa Community Colleges.